Ever wonder what years of water build-up on untreated wood will do? 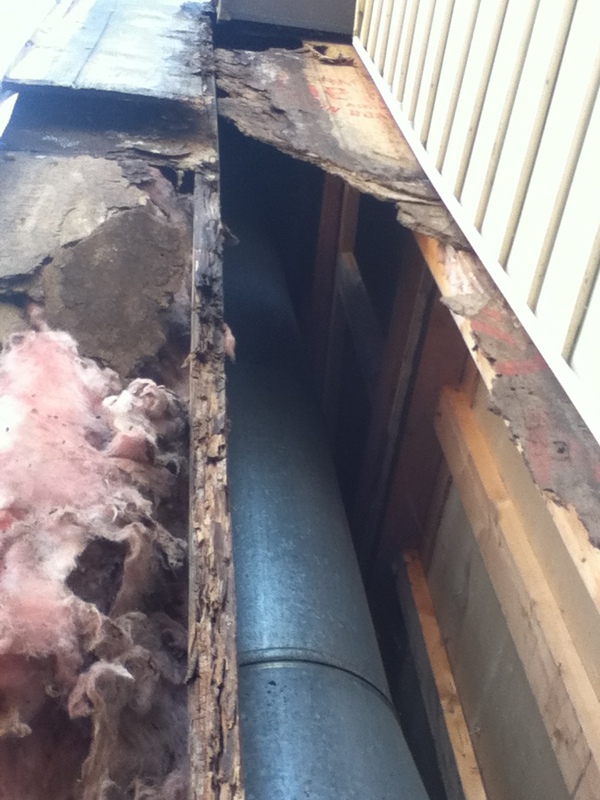 The answer is simple: Lots and lots of rotten wood! Steve Way Builders, LLC was recently contracted by the homeowners of this Lansing, Michigan home to investigate the source of some water damage showing on some drywall within the home. Upon further investigation, the source of the water problem was unmistakable. For roughly 20 or more years, water was running within the wall of the chimney due to improper roof flashing. To fix the flashing and water damage problem, Steve Way Builders, LLC needed to re-flash the chimney and fix any wood that has been damaged. 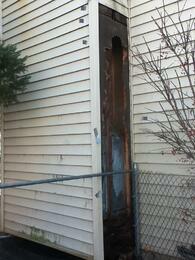 After removing the vinyl siding and sheathing on the chimney wall, the water damage was extensive. The sheathing was completely rotted away, as was one of the 16' wall studs in the chimney wall. 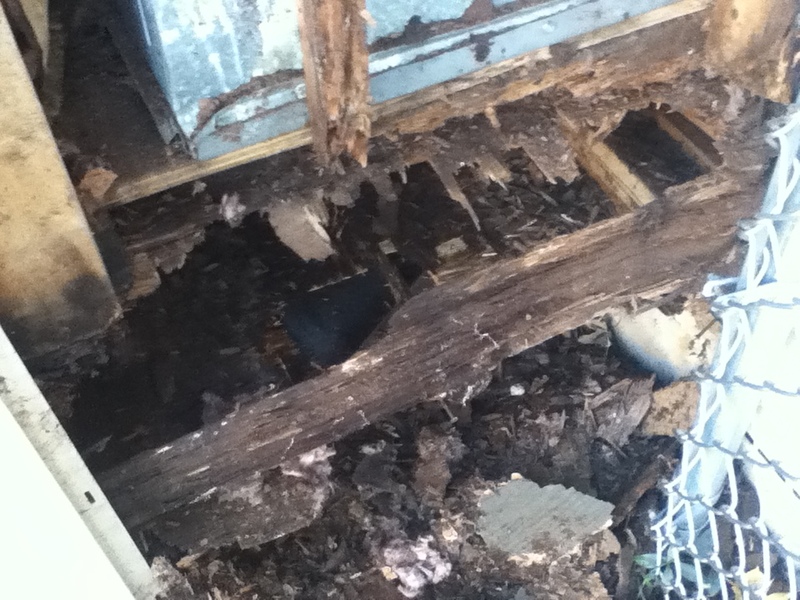 Also badly rotted was the floor joist and subfloor system of the cantilevered chimney base. After the rotted wood was removed, new joists were "sistered" in to the original floor system and a new stud was installed to finish the chimney wall framing. New insulation was installed in the chimney to replace the original water logged insulation. The new chimney wall was sheathed with plywood and covered with Tyvek HomeWrap to help prevent moisture from entering the chimney wall. With the chimney framing fixed, Steve Way Builders, LLC removed roof shingles to fix the flashing surrounding the chimney. Aluminum coil stock was custom bent to create multiple flashing pieces for the chimney. After fixing the chimney flashing, the shingles and vinyl siding that were removed earlier were re-installed, completing the chimney repair. 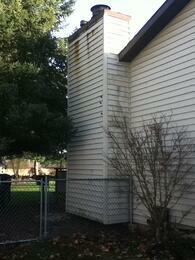 As seen in this home, poor roof flashing can cause major problems within a home. The best way to prevent water damage is to have the job completed correctly the first time around. Unfortunately this is not always the case. When you find yourself with a water leak, fix the problem as soon as possible to prevent mold build-up and to keep the costs to fix the problem as inexpensive as possible. What other suggestions to do have regarding water damage and roof flashing? Have you found yourself in a similar situation? This addition of "Home Remodeling Project Updates" focuses on a metal roof repair in Lansing, Michigan. 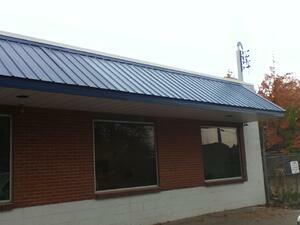 Steve Way Builders, LLC was contacted by the Habitat for Humanity of Lansing to fix the metal awning on the front of their office building. The metal awning was hit by a box truck while loading and unloading materials. 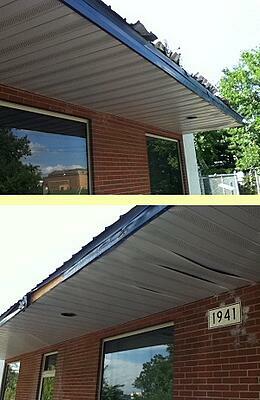 As a result, the ends of the metal roof panels had been damage, as well as several pieces of fascia and soffit. Luckily, the buildings roof was not damaged to the point of leaking, yet unfortunately, the aesthetic appeal of the Habitat facility had suffered. 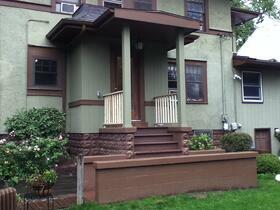 The first step taken to replace the metal roof was to get a color sample. One of the most important things when completing a repair, as opposed to a complete replacement, is to make sure there is a seamless transition from original material to new material. Once the color was obtained and matched, the material for the metal roof was ordered. 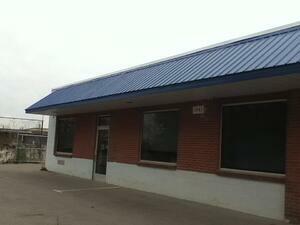 In total, six panels of 3' wide metal roofing sections were removed and replaced. Six of the ten pieces of metal fascia were also replaced due the damage from the box truck. The soffit under the awing was also able to be repaired and re-nailed. With the metal roof repaired and replaced, the Habitat for Humanity of Lansing is able to do what they do best; Continue helping the community while maintaining a professional and positive image. Do your have any questions or comments about this metal roof repair? What style of roof do you like better: Metal or Shingles? In Part 1 of the "Interior Trim Series," we provided instructions for installing base moulding in the inside corner of a room, and also included a list of tools that are needed to complete this "do it yourself" home improvement project. Part 2 of the "Interior Trim Series" will now focus on the installation of base moulding around a corner. Follow the step-by-step instructions below, and use the picture to help with the installation process for the outside corner. Measure your first base trim piece. Remember that the base moulding will wrap around the corner, so your measurement from the corner will be the cut from the back side of the trim piece (for clarification, refer to the middle left picture). Set the miter box at 0 degrees for a square cut, and set the bevel at 45 degrees. This is only if the corner is a 90 degree corner, adjust the bevel accordingly for other degree corners (refer to the left most picture). Cut first trim piece at this angle. Reverse angle for next trim piece. Measure and cut the next piece at this angle. This piece of base trim should wrap around the remaining edge of corner. Hold trim pieces together at the corner to test for a proper fit (middle right and farthest right pictures). If the trim pieces create a tight seam, then they are cut properly and can be nailed into place. If not, adjust the bevel angle accordingly and try again. Remember that trim corner pieces do not always fit perfectly and adjustments may need to be made. For your first attempt at the corner, cut the base trim pieces slightly long. After all, you can always cut a little more off, but you cannot add any more wood to your piece. In the next addition of the "Interior Trim Series," we will show you how to properly join trim pieces together when your wall is longer than your base trim piece. This can really come in handy with difficult trim pieces that have an inside corner on one end, and an outside corner on the other. If your unable to cut both, split it into two pieces. Until then, what questions do you have with wrapping base moulding around a corner? Need or have any extra tips? Today's carpentry tip will show you how to increase the value of your home by installing interior base trim in any room within your home. Replacing base moulding is a rewarding "do it yourself" project for the crafty homeowner looking for a weekend home improvement project. Part 1 of this Interior Trim series will provide you with helpful tips, along with step by step pictures and instructions, for installing base trim within your home. It will focus on the first difficult area of trim installation, the interior corner. With basic carpentry knowledge, installing base trim in your home is a fairly simple process. The trim is installed around the perimeter of the room at the base of the wall and tight to the floor. It is attached to the wall by using trim nails from the air nailer (a hammer and trim nails can be used if an air compressor and nailer are not available). Base moulding can be installed on floor and wall types. The first difficult area in installing base trim is the inside corner. The picture below will help walk you through the step by step instructions. Measure for your first piece of moulding. This piece can run the length of the wall and fit tight from one corner to the next. Cut the trim piece square (0 degrees on the miter box) so that it fits tight to the wall. Now you need to prepare the next piece of base moulding so that it fits tight in the corner with the first. This is done by cutting a 45 degree angle with the miter box (farthest left picture). The next step is perhaps the most difficult in the process. Take the coping saw and cut off the exposed section of the 45 degree angle cut. This will leave you with a perfect scribe to fit into the corner (middle two pictures). This process takes a little practice, so if your cut doesn't look very good, then try it again. The final step is to slide the trim piece into the corner and see how it fits. If your cut with the coping saw is accurate, the trim piece will slide into place, creating a tight fit with the first piece of moulding in the corner (farthest right picture). Once again, if your cut doesn't fit right, try it again as it does take practice. The inside corner may be the most difficult part of installing base trim within your home. 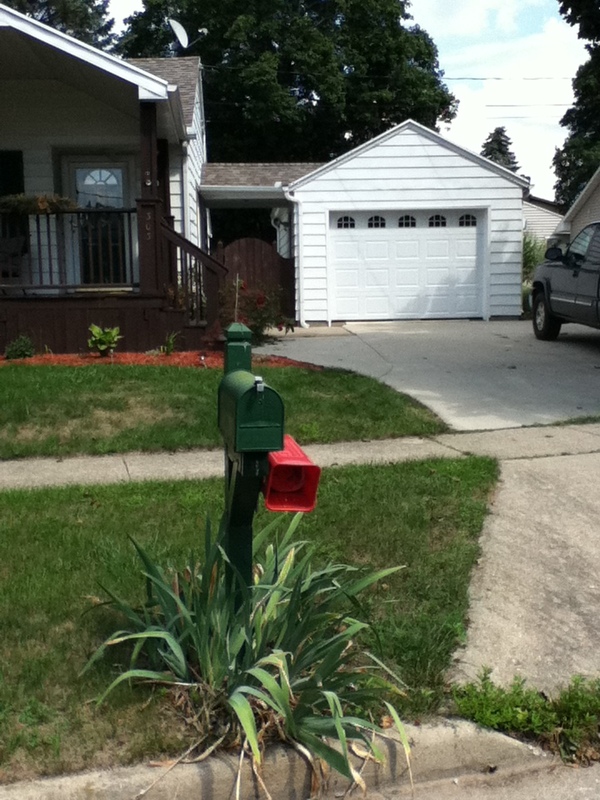 But with time and practice, it is a manageable "do it yourself" home improvement project for the crafty homeowner. In the next addition of the "Interior Trim Series", we will take a look at the steps taken to complete the outside corner for installing base trim. What questions do you have regarding the interior corner? Any clarifications or other helpful remodeling tips? 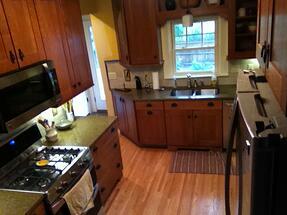 Steve Way Builders, LLC is nearing completion on a kitchen and bathroom remodeling project in East Lansing, Michigan. 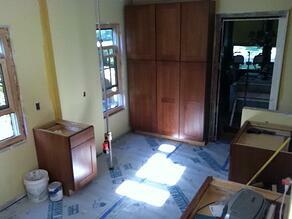 The kitchen, bathroom, and mudroom are awaiting final paint to complete their newly-designed home transformation. The last "Home Remodeling Project Update" left us with kitchen and bathroom cabinets waiting to receive counter tops and final trim. 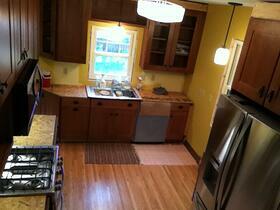 Currently, the remodeled kitchen is 95% complete. The cabinets have all of the trim work completed, including crown moulding, furniture base, and shoe mould. The nail holes have been filled to complete the final detailing of the kitcen. Last week, the quartz kitchen counter tops were delivered and installed, which allowed for the sink and faucet to be connected. Also completed last week was the ceramic tile backsplash with accent tiles. These main additions to the kitchen are really starting to show its finished appeal. The upstairs full bathroom is nealy complete as well. The bathroom vanity sink and counter tops are now installed. 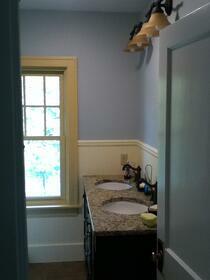 The paint on the walls, trim, and wains coat is also completed within the bathroom. The only thing this remodeled bathroom is missing is the mirror, which is scheduled for delivery next week. Work in the rear entry mudroom is being completed as custom lockers and shelving have been built and installed. The maple locker units have been stained and custom doors are being made to match the kitchen cabinets. Outside the mudroom, the temporary deck and stairs have been removed and replaced with composite decking by AZEK Building Products. The mudroom will be completely finished this week as it will receive its final coat of paint. Once these portions of the home are completed, the major remodeled areas will be finished. The final step for the project will be the installation of wall cabinets in the laundry room and an encased shelving unit with glass shelves in the living room. By the end of next week, this project will be completed and Steve Way Builders, LLC will be moving onto another project. With this home nearing completion, what is your favorite part of the remodeling project? 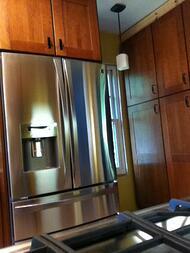 There are several questions one should ask oneself before deciding on a remodeling project. Here are a few tips and reminders to help you when you are preparing for a major home remodel. Let's be realistic here. Most, if not all, home remodeling projects are thought of because we want something. There's nothing wrong with that, it is important to reward yourself once in awhile. But establishing the difference between wanting something and needing something is very important in determining a home remodeling project. This is different for everyone, so establish a balance before you jump into a remodeling project. Now that you have decided on a project by separating your needs and wants, you need to create a budget. 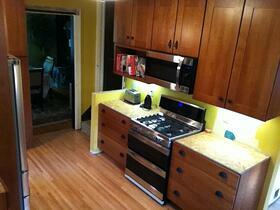 Whether or not you can afford the remodeling project is the ultimate determination for being able to complete it. If you have several projects you would like to complete, yet cannot afford the whole thing, separate it out. First complete your deck, then fix those floors, and so on. Once you have decided on a remodeling project, it is important to establish an alternative living space. Major remodeling projects take time and will limit the usage of the room being remodeled. If your kitchen is being remodeled, have another space in your home prepared so that you can store your pots, pans, plates and so on. This goes the same with a bathroom or dining room. Contractors will try thier best to keep a room livable, but it is impossible to keep it at 100%. These are just few things to think about when deciding on a home remodeling project. It is important to understand the "big picture" of a major home renovation to ensure that all necessary steps are taken in order to be the most prepared. What other questions do you have? Leave your comments below and we will be happy to help. Steve Way Builders, LLC is starting to complete finishing work on a Kitchen and Bathroom Remodeling project located in East Lansing, Michigan. This remodeling project has consisted of completely demolishing the original kitchen and bathroom in order to create newly designed areas within the home, as well as the addition of a mudroom and rear entry area. The last "Home Remodeling Project Update" showed the initial installation of the kitchen cabinets as well as the newly installed oak hardwood flooring in the kitchen area. The painting had also been completed in the kitchen. The upstairs full bathroom had received new ceramic tile and was awaiting to be painted. 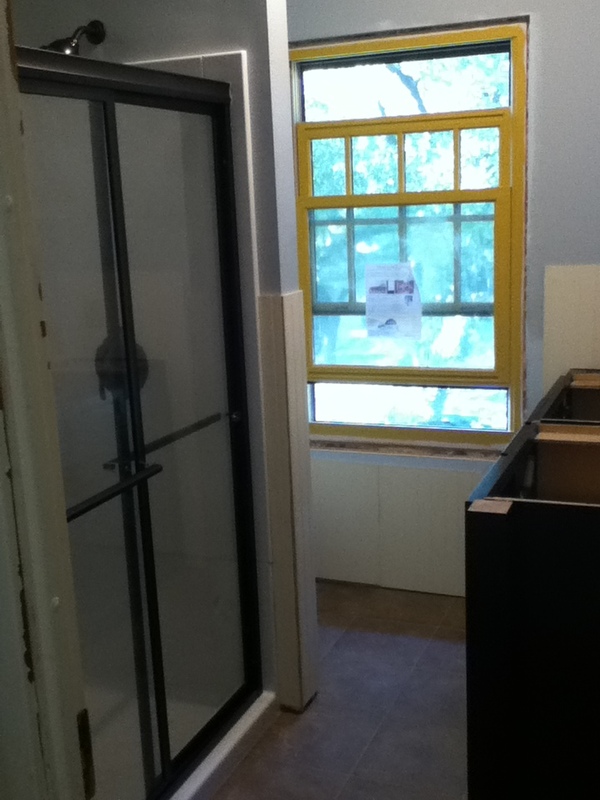 The ceramic tile in the mudroom had also been installed and paint is to be completed at the same time as the bathroom. Now for the most current updates for this kitchen and bathroom remodel, starting in the kitchen. The rough installation of the Mid Continental Cabinets have been completed and finish work has been started. The finish work includes crown moulding, toe kick, and hardware for the cabinet doors and drawers. The kitchen appliances have also been delivered and installed. The dishwasher is set in place but will not be installed until the new sink and counter tops are delivered. All the finish electrical work is completed within the kitchen area. The only thing left for this kitchen remodel is the remaining crown moulding, base and window trim, and lastly, the sink and counter tops which are currently being scribed. The upstairs bathroom has also had some drastic changes since the previous remodeling update. 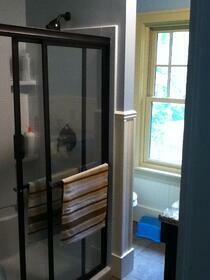 The fiberglass shower is now complete with fixtures and a sliding glass door. The toilet stool has also been installed, as well as the double sink vanity. The painting has been completed, and a decorative wood wains coat is currently being installed. The finish electrical work is close to being finished, but is on hold until the bathroom fan light is vented to the outside. The next steps for this bathroom remodel includes the completion of the wains coat, base and window trim, and the sink and counter top. The mudroom and rear entry addition has received its final coat of paint for the interior walls, and is awaiting the completion of the custom shelving units. The electrical work has been completed. 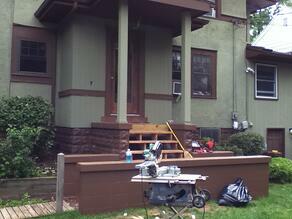 The exterior walls have one coat of paint finished and will receive a second coat at a later date. The composite deck material will be delivered early next week and will be installed by the end of the week. The homeowners, as well as ourselves, are really excited as this home remodeling project is getting closer and closer to being a finished product. Check back in a couple of weeks for the next addition of our "Home Remodeling Project Updates." Until then, what questions do you have regarding this project? Leave a comment below, or ask us a question to get your dream home makeover started today. If you have been following along with the previous addition of "Home Remodeling Project Updates," you will be glad to see that Steve Way Builders, LLC is moving right along with this Kitchen and Bathroom Remodel in East Lansing, Michigan. If you need to catch up, here's a brief description of the remodeling project. The original kitchen and adjacent half bath have been demolished and joined together to make into one large, redesigned kitchen that includes new oak flooring, cabinets and counter tops, windows, and appliances. The upstairs full bath is also being completely remodeled and features a double vanity sink, 4 foot fiberglass shower stall, and ceramic tile flooring. The original rear entry will transform from a covered porch into an enclosed mudroom with cermamic tile floors and custom shelving. Now for the newest updates. 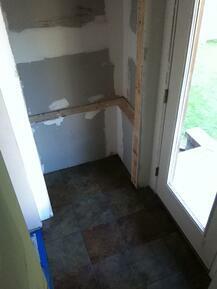 The ceramic tile floors in both the bathroom and the mudroom addition have now been installed. Resilient floor heating mats have been installed underneath the ceramic tile in both the bathroom and mudroom. The drywall in is now completely finished and sanded througout the entire project, allowing for painting to make it's stamp on this home remodeling project. The kitchen, as well as the the exterior vertical siding of the mudroom addition, have received their base coats of paint. The paint on the masonry block walls outside the mudroom is completely finished with paint after receiving two coats. 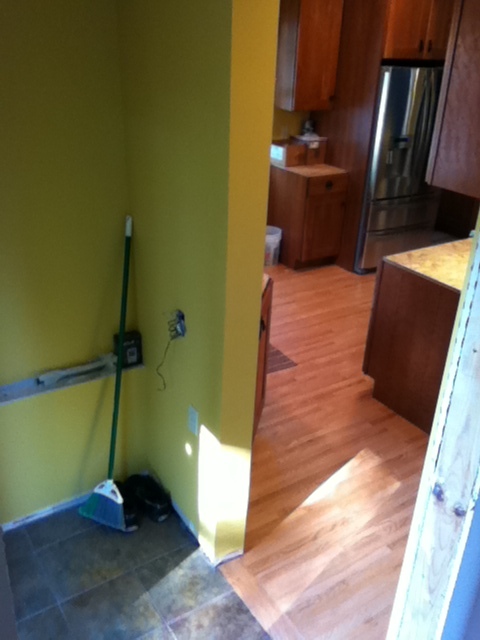 The main focus now is within the kitchen remodeling portion of the project. As stated earlier, the base coat of paint has been applied to the walls and ceiling. The hardwood oak flooring has also been installed. This makes room for the kitchen cabinets to be installed. 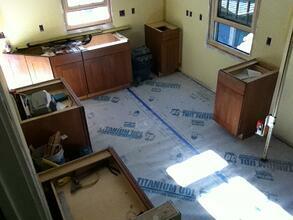 Currently, all of the base cabinets are set in place, and the upper wall cabinets are next in line. 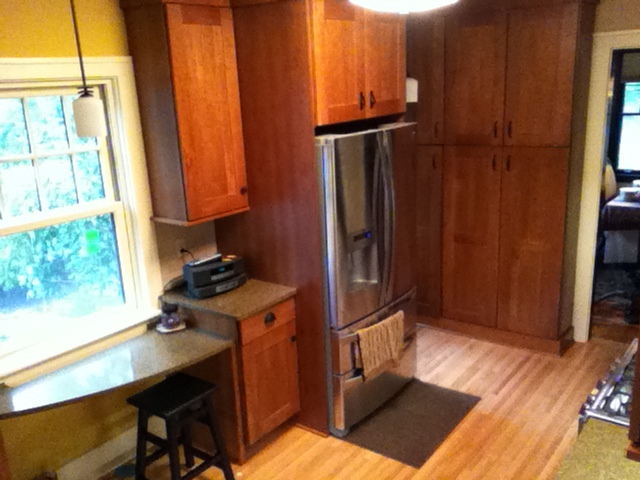 The maple kitchen cabinets have a cherry color and a harvest finish. Next in line for this home remodeling project is the completion of the kitchen cabinets, as well as getting the counter top scribed and cut, so that it can be installed. The painting also needs to be completed for the bathroom, mudroom, and wood siding, and the second coat needs to be applied in the kitchen. Every day is exciting as this project gets a little closer to a final product. What questions do you have about the completion of this project? Let us know in the comments section below. Or give us a call to schedule your home remodeling project today! 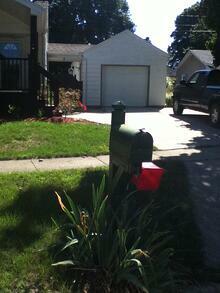 This week, Steve Way Builders, LLC took on the task of replacing a garage door in Mason, Michigan. The original garage had an 8' wide X 7' tall door that was simply too small. The homeowners contacted Steve Way Builders to replace the door with a 10' wide X 7' tall door with cascade style windows in the top panel. The garage had to be slightly remodeled in order to install the new door. First, the aluminum siding had to be removed from the ground level to above the top of the header so the opening could be increased to make room for door. A 2" X 12" header was installed to support the span opening, and 2" X 6" 's were installed for the completion of the door jambs. Once the door was installed on its tracks and the automatic opener re-installed, coil stock was used to trim the exterior face of the door jambs to achieve a nice finished appearance without painting the trim. Concrete patching was needed to fill the side sections of the larger garage opening, completing the door replacement for this remodeled garage. A difference can easily be seen by comparing the before and after pictures above. A testimonial written by the homeowner can be viewed by clicking here. 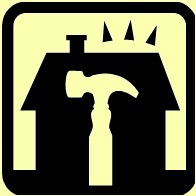 Be sure to check back tomorrow for Part 2 of this weeks "Home Remodeling Project Updates." 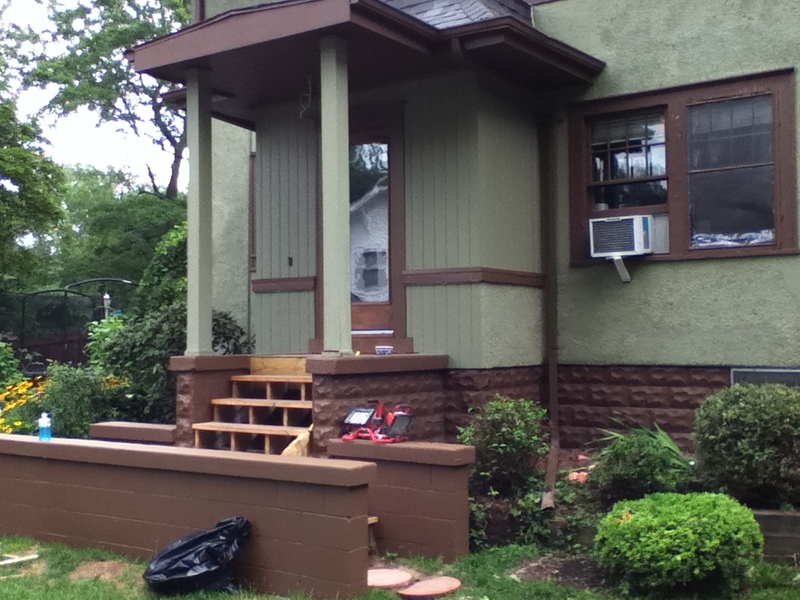 Until then, do you have any questions or comments regarding this remodeling project? Please ask in the comments section below. Every home remodeling project is different. Each project is unique in its own way, and in turn, requires its own specific questions. But there are some common questions that should be asked when you are selecting the right remodeling contractor for your project. 1. Have you completed a project similar to this one? It is important to know if the contractor has the knowledge and skills to complete the particular project being discussed. People have different talents. Be sure that their experience in the industry prove beneficial for your project. If your interviewing a contractor who only specializes in exterior renovations, why would you have them install kitchen cabinets and counter tops. Make the contractor can prove to you that they can complete the job successfully. Remember, it never hurts to ask ti see pictures of their work, or perhaps even seeing completed remodeling projects in person. Ask the interviewing remodeling contractor for referrals. After all, a past customer is the best example for proving top quality work and craftsmanship. A contractor is bound to speak highly of themselves, and most of the time it is true. But let others who have already worked with them tell you how good they are as well. 3. Who will be completing the work? Subcontractors? Self? It is important to know who will be actually working on your home. Will you be meeting a new person everyday or dealing with the same people? Is there a crew leader that you will be dealing with? Getting to know and building a positive relationship with your contractor and his/her employees will ease communication and make the whole experience more enjoyable. 4. Who should I direct my questions to and how should this be done? Once you have established who is completing the work, you need to know who to direct questions to and how it should be done. Some contractors prefer that all questions should be directed to them personally and not to those working on site. This way the crew can stay productive, and the whole "he said this and she said this" misunderstandings can never occur. Other times, contractors will have a crew leader on site that can answer all, or most, of your general questions regarding the work. Since communication is very important during a remodeling project, it's best to keep it easy. Whether it is a question directed from contractor to home owner or vice versa, each party needs to know how it should be done. Should you strictly stick with talking over the phone or via email? If by phone, should you call the office/home phone or a cell phone? With the advances in social media and smart phones, sometimes it is easier to send emails or instant messages. It is up to you and the contractor to choose the form of communication that works the best. 5. How long will the project take to complete? This question not only will help you compare contractors' knowledge and productivity, but it will also help you plan for the upcoming project. Having your home under construction can be very stressful and inconvenient. Simply asking this question will help you fully accept what is going on and what you will need to do to prepare for it. It is just like the well know saying, "It's easier said that done." These are only a few questions that should be asked when planning your home remodeling project and choosing the correct contractor for the job. Feel free to add to this list. 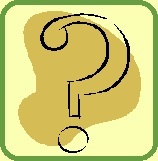 What other questions would you ask and why?